It has forever been a challenge to make a fish dish that Graham and I can both really enjoy. Don’t get me wrong — I love fish. Everything from mackerel and sardines to halibut and salmon. Graham, on the other hand, not so much. Growing up, my mom prepared a lot of fish for us to eat so it was pretty commonplace around our house. Of course, this meant that we had to close all the doors to our bedrooms while she broiled mackerel in the oven because the smell would linger for longer than should legally be allowed. The fish was delicious but fishy clothes at school… so not cool. In having to prepare fish in my own home, I’m not quite ready to initiate Graham in the harsh lessons of cooking oily fish (nor am I willing to allow our upholstery to be impregnated with the odiferous scent of mackerel) so I figured salmon was as good a place as any to start introducing fish into our regular weeknight dinner rotation. I tried a couple of different types of seasoning (soy-glazed, lemon and salt) that would past muster but never wowed him (or me for that matter). Then one day, he came home from a weekend camping trip singing high praises about a salmon dinner one of the guys had prepared. Lemon and dill. The secret ingredients to take fish to the next level. The recipe was obtained, a few tweaks here and there, and voila! Lemon Dill Salmon was born. Just out of the oven. You can’t hear the sizzle but oh my, it sounds (and smells) heavenly! Slice lemons to yield twelve even slices (six per lemon). Save the ends of the lemons for next step. Combine softened butter, grapeseed oil, white wine, shallots, and garlic in a bowl. Squeeze in lemon juice from leftover ends of lemons. 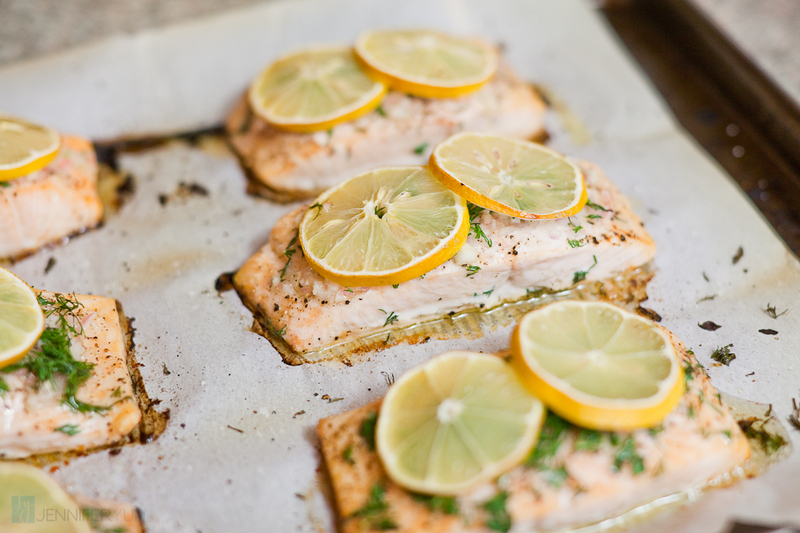 Lay the salmon fillets on a parchment paper lined baking sheet and season with salt and pepper. Spoon oil mixture over each salmon fillet evenly. Sprinkle the fresh dill over each piece of salmon and then top each piece with two lemon slices. Place in the oven and bake for 10 minutes, or until the salmon flakes easily with a fork. Remove from oven and allow the juices to settle for five minutes (the salmon will continue to cook slightly during this time so be careful not to overcook it in the oven). 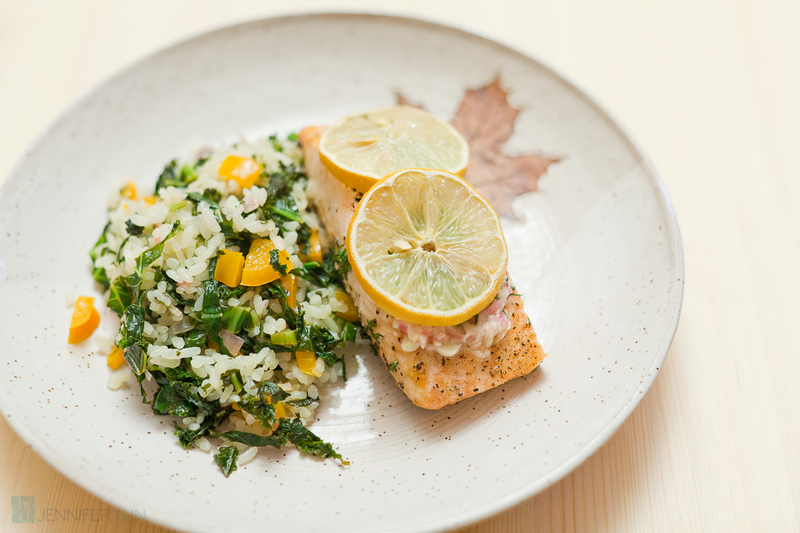 Recipe keynotes: A light, tangy salmon that takes very little time to prep to provide a healthy protein option for a weeknight dinner.